Before the Migratory Bird Treaty Act was passed, hunting of birds was basically unregulated. In the 1870s, as many as 15,000 canvasback ducks were killed on a daily basis by market mercenaries using battery and punt guns on the Chesapeake Bay alone. Bobolinks and Cedar Waxings were apparently served in restaurants, along with wild bird eggs. Egg collecting was a popular hobby. A 1922 price list for oologists (people who study eggs) offered House Wren eggs for 15 cents and Bald Eagle eggs for $10. 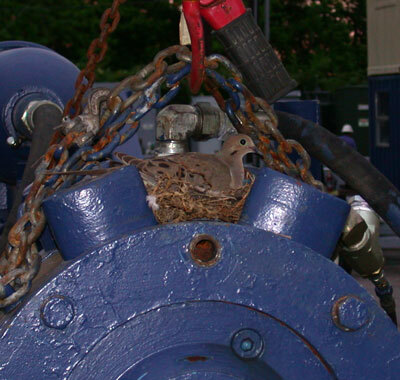 It is illegal to disturb the active nest of a native bird, even if it is in an inconvenient location (like this mourning dove nest on construction equipment), without a permit from the U.S. FWS and sometimes from the State also. Permits are seldom granted. Stuffed birds adorned hats in the late 1800s. The author of Birds and Men (published in 1955) described a woman’s dress reportedly decorated with the patches of 3,000 Brazilian Hummingbirds. The fad of collecting birds drove the Ivory-billed Woodpecker closer to extinction. An 1890 photograph shows famous ornithologist William Brewster by Florida's Suwannee River with a freshly shot Ivory-billed Woodpecker on his lap. Then people, including sportsmen, became concerned about wholesale slaughter of certain species. This prompted passage of the Migratory Bird Treaty Act in 1918. Many folks do not know that this law makes it illegal to harm, trap, transport or collect nests, eggs (even for educational purposes), or young or adult native birds without a permit, with a few exceptions. The Act even makes it illegal to have bird feathers or road-killed birds in your possession, or to try to incubate wild bird eggs without a permit. It is also illegal to remove or move nests, even when the birds choose an inconvenient location, like your newspaper tube or construction equipment. Despite the title, the Act protects birds that may not migrate, like Morning Doves and Chickadees. There are exceptions for non-natives such as House Sparrows, Starlings, Domestic Pigeons/Rock Doves, Monk Parakeets, and Eurasian Collared Doves. Federal law allows control of these introduced species, as long as it is done in a humane manner. Permits under the Migratory Bird Treaty Act are seldom granted to individuals, even for research. A state permit may be required in addition to a federal permit. Exceptions may be made when gargantuan flocks of birds create a major nuisance or cause severe damage to agriculture. The US Fish and Wildlife Service can issue a Migratory Bird Depredation Permit for "activities necessary to provide for human health and safety, protect personal property, or allow resolution of other injury to people or property.” A permit like this might be granted to address ongoing wildlife conflicts like gulls nesting and damaging flat rooftops, or geese overrunning a park. No permit is required merely to scare or herd depredating migratory birds other than endangered or threatened species and bald or golden eagles. as a means of monitoring the extent of this activity,” says Vann. The U.S. Fish & Wildlife Service is responsible for administering this Act. 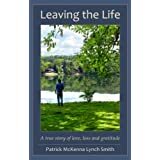 While the law is not often enforced, penalties are severe - up to six months in jail and fines of up to $15,000. Equipment used to pursue, hunt or trap can also be seized. To learn more about the control of any migratory bird, contact the CT DEP Wildlife Division at 860.424.3011 or the USDA Wildlife Services at 413.253.2403. Note: If you find an injured native bird (e.g., hurt by a car or cat), immediately contact a licensed wildlife rehabilitator who handles birds. These people are trained and permitted to try to save the bird, and have a much greater chance of success than you would. To locate a rehabber near you, see www.tc.umn.edu/~devo0028/contact.htm or call your wildlife management agency. Welker, R. H. 1955. Birds and Men. The Belknap Press of Harvard University Press. Cambridge, 230 pp. ).